When I think of dressing for fall, two things come to mind: sweaters and boots. A trend report on the former is coming next week, but in the meantime, here are boots. I always buy at least one pair of new boots each year, and for 2018, it's all about western-style boots. I'm not talking full-on cowboy boots, although that style is out there—as a city-dwelling northerner, that feels a bit inauthentic to me. I'm also staying away from fringe, as that was a boot trend a few years ago (and can still be found in stores). 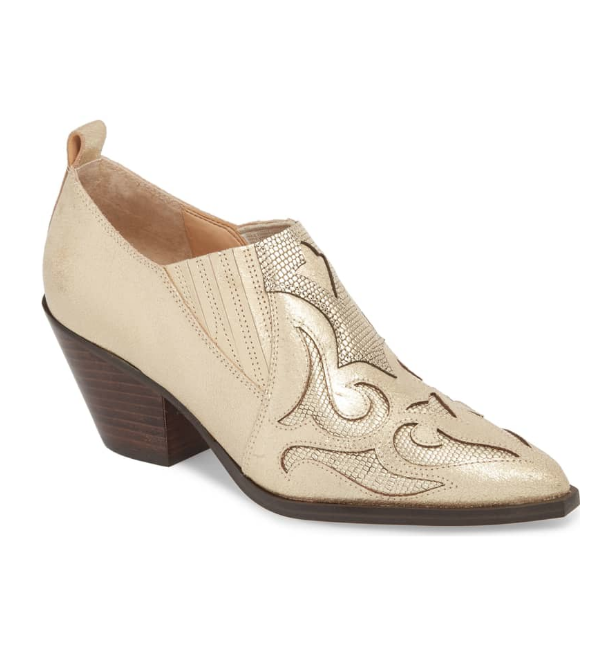 Instead, these are a more refined take on the western boot, although some have more flair than others. Here are my favorites for fall. 1. This is one of my favorite pairs of the bunch—the heel is not too high or too low, the toe is not too pointy (but is just pointy enough), and it has a fun metallic finish. It's a very, dare I say, wearable take on the trend. 2. 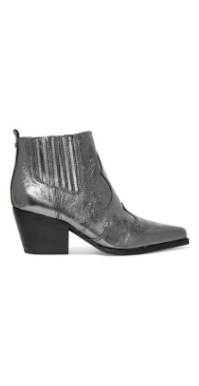 These are more of a "shootie" than a boot, and the cutout details might not be for everyone, but of all the boots here, I think this one would look the most flattering with a skirt. It also comes in several other colors, including a more subtle black. 3. I tried a pair of red boots a few years ago and they were just too loud for me at the time. I am willing to try again, and these would be a good contender. They have a lot going on with the studs, but as I've discovered, sometimes a bright color with studs just works. 4. 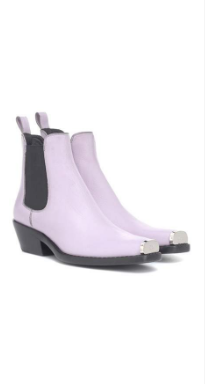 These boots remind me of a pair I had years ago that literally disintegrated because I wore them so much. 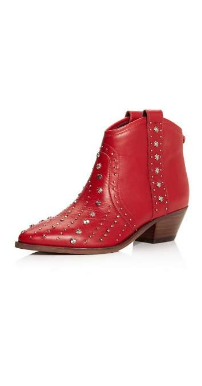 They're a more refined take on the trend, but the studs are fun and the front notch is more flattering to the leg. 5. 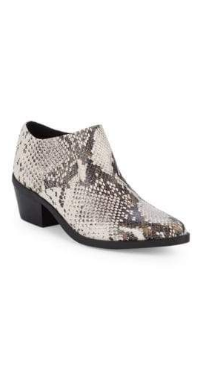 These booties combine two trends—western and snake print—all in one, and considering the price, they're pretty much a no-brainer. The chunky heel looks just about perfect, too. 6. These boots have nearly 200 5-star reviews, and I can see why. The side cutout detail eliminates the need for a zipper or elastic gusset, and the metal tips add just the right amount of cool detail. They come in a bunch of different colors, but basic black is the most appealing to me. 7. And now, onto the splurgier end of this post. These Calvin Klein Boots are one of the more liberal interpretations of the trend, but the offbeat color and contrasting details make them really cool and modern-looking. 8. 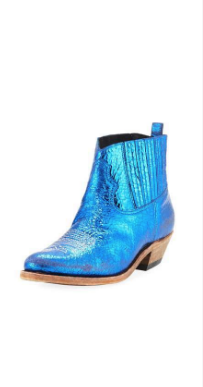 These boots come in several different colors, ranging from basic camel suede to totally out-there glitter, but this metallic blue is my favorite, if only because it's a color you don't normally see IRL. I have no idea what I'd wear these with, and yet I feel like I need them. Buuuut maybe I'll wait for them to go on sale. 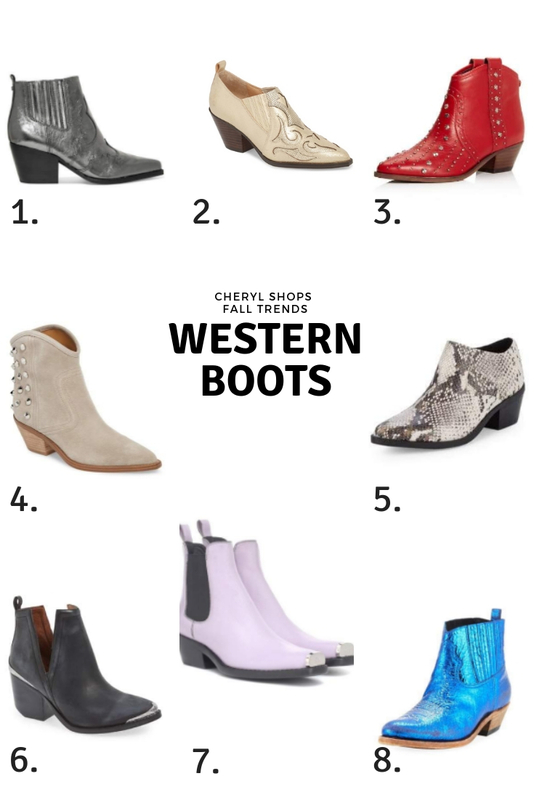 THe western boot trend is so much fun! 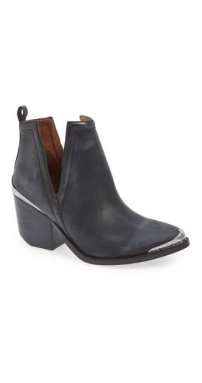 I have a pair of black booties just sitting in my cart waiting for me to check out! Great picks! So many cute western boots here. I love the pink ones and I also love those little slits/cut outs! Very cute picks! I am loving the metallic ones! 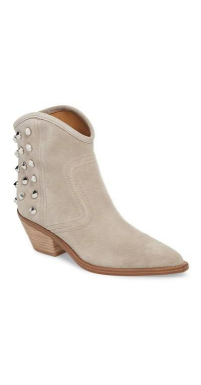 I have a couple of pairs of ankle boots, but they are just neutrals, I'd love to add a fun pair to my wardrobe! Great picks. Liking the snake skin pair! 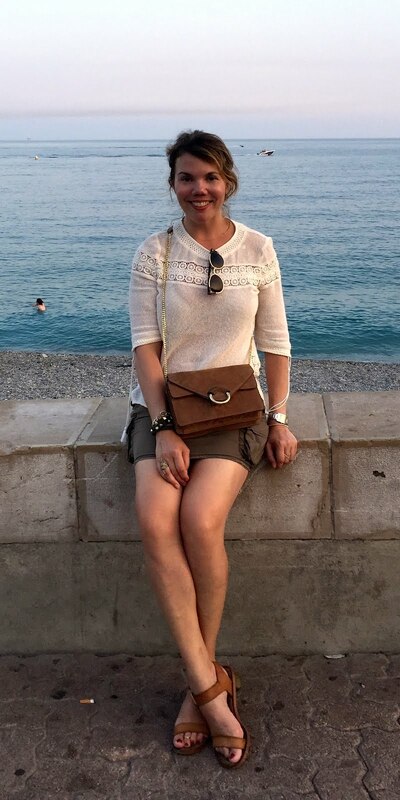 I love the Marc Fisher boots you showcased! They are so stylish and a kind of updated western looo!